Your Humble Narrator spent the past weekend in Manchester, visiting friends, catching the Architecture In Helsinki gig there, and seeing some of the sights. Apparently there's also a big electro-pop scene happening, continuing the Mancunian tradition of combining guitar-rock and dance electronics. There didn't seem to be anything of that sort happening on Saturday night though. 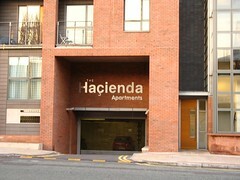 There is one remaining venue connected with New Order in Manchester: the Dry Bar on Oldham St. Though forget about it; it's not remotely interesting. The interior looks like a suburban pub (or, to the Australians in the audience, like a RSL club), and apparently it's full of lagered-up chavs on most nights. There is a lot else to see around the Oldham St. part of Manchester (which is sort of like Byres Road, Glasgow, or a more grungy Brunswick St., Melbourne). 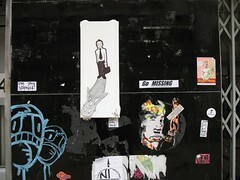 The ubiquitous sticker/paste-up art, for one. The shopping's quite good, especially for records (because it's not London, second-hand CD shops tend to have more interesting selections at more reasonable prices). I ended up taking back as many CDs as I could fit in my backpack (roughly 15). A 14-year-old boy in Manchester used internet chatrooms to arrange his own murder; masquerading as, among others, a 16-year-old girl, her step-brother, and a secret service agent named Janet, he managed to talk a 16-year-old boy he had never met into stabbing him. The other boy was told that it was an initiation into the secret services, and that the target was dying of cancer, which made him expendable; if successful, he was told he would get £500,000, a gun and a meeting with the Prime Minister. It apparently did not occur to him that there was anything unusual about this arrangement (persumably that's standard MI5 procedure for recruiting teenagers in chat rooms). Update: more details have emerged, and it turns out that the stabbee had a hopeless crush on the boy who stabbed him, and instructed him (in secret-agent guise) to say the "codeword" "I love you, bro" as he did the deed. This is sounding more and more like a Smiths song. Interestingly enough, Pravda (aka the Russian equivalent of either Ananova or the Weekly World News, depending on when you look at it) have now added a Portuguese translation to the English and Russian. Could this be an acknowledgement of the rising power and influence of the Portuguese blogosphere?